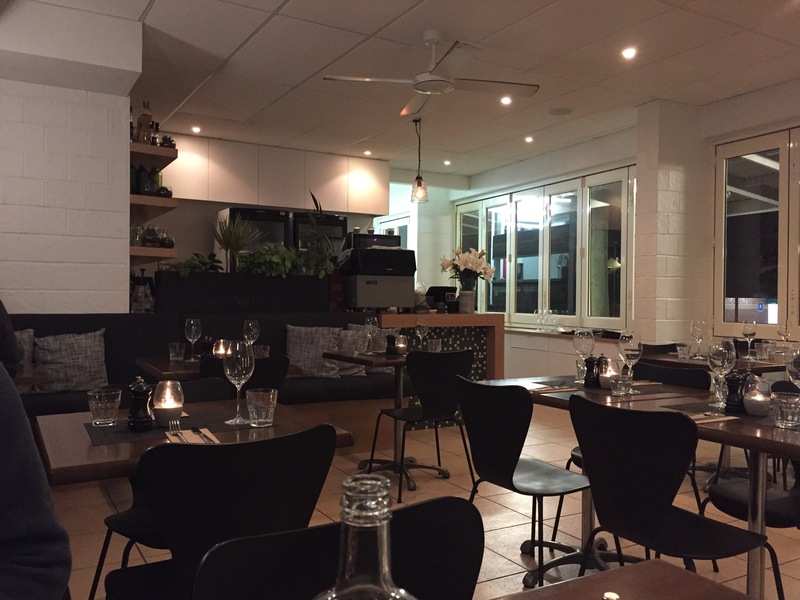 A newcomer to the Sawtell dining scene is Abicus, a casual but sleek restaurant at the roundabout at the end of the main street. Behind its banks of exterior glass windows and dressed in timbers, white walls and splashes of green, the space says cafe – crisp, cool, clean – but the food says restaurant and indicates a chef who clearly knows what he’s doing. The food is contemporary and thoughtful without trying to be too precious. 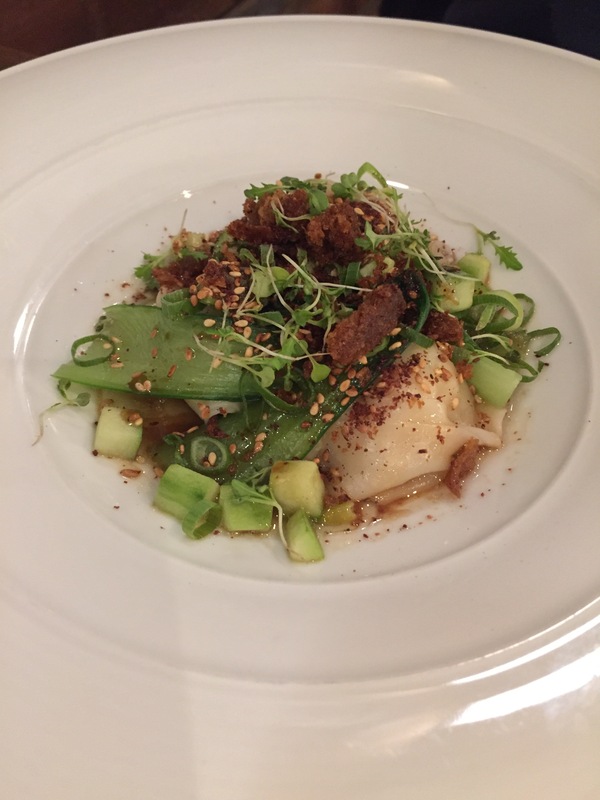 For entrees, marrying pepper and lime squid with coconut and pineapple brought an unexpected sweet zing to the plate, along with memories of beach holidays, while the lashings of greenery in the form of pak choy and cucumber balanced the saltiness of the vinaigrette of the lobster ravioli nicely. And didn’t it look fresh and appealing? 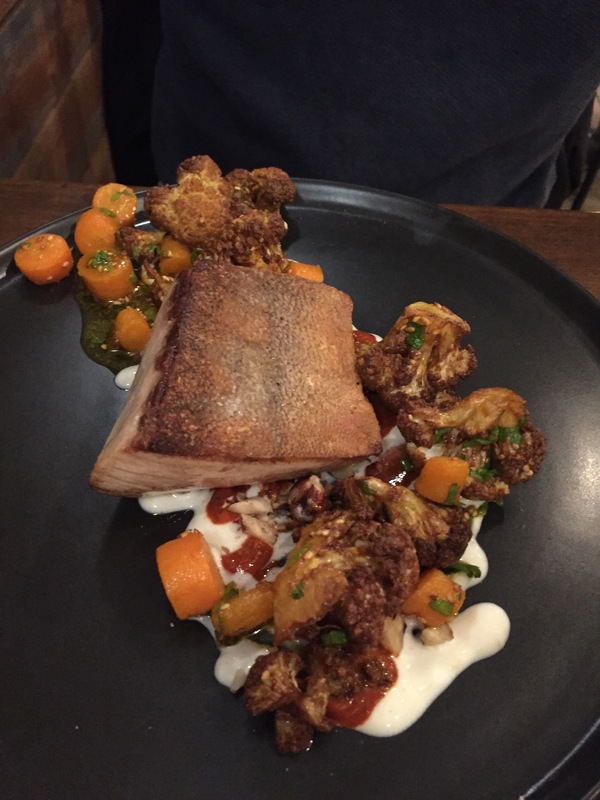 The native fish dish (snapper) was light and fresh and well matched with the richer Persian flavours of harrisa and a touch of lemon yogurt, dutch carrots and fried cauli on the edges, although the very centre was undercooked and remained on the plate, unremarked on clearing. 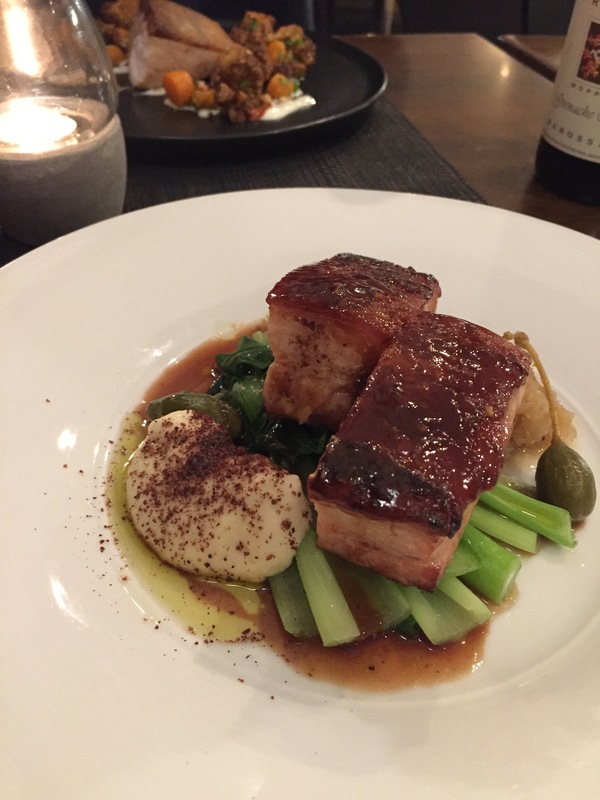 The pork belly was beautifully rendered and served well by the smooth celeriac puree and other flavours. And what a welcome relief to find there were sufficient vegetables served with main meals to make them complete affairs in themselves without requiring the add-on sides. A mid-week visit meant that the restaurant was quiet, but it also meant that it was ‘locals’ night’ with a good value choice of two courses for $45 or three for $55 on offer, even though as interstaters we were far from locals. If only our fellow Canberrans had known they too could have escaped the winter cold and scored a deal at the same time. If you can’t make choices or you have big appetites, there’s also degustation option as well. I can’t normally manage a three courser, but couldn’t resist the temptation of ‘white chocolate mousse, local passionfruit, meringue, toasted coconut, coconut sorbet’ at the end. That’s what happens when someone puts all your favourite things on one plate and tells you about it. And I’m so pleased I succumbed. There’s a chocolate option too for those with more stamina. The restaurant is fully licensed but they’ll let you BYO for $12 a bottle. We did. Abicus follows another restaurant in the same location with quite a reputation for good food so it has big shoes to fill but it’s covering the ground pretty well with generous servings of well-balanced and interesting flavours, without too much fuss but presented with finesse. Apparently they also do events and corporate catering. I wonder why they spelled it Abicus though?